Hamburg - The Sino-Tibetan Conference «Finding Common Ground» starting on 26 August 2014 concluded this afternoon in Hamburg, Germany. The Central Tibetan Administration (CTA) based in Dharamshala (India) convened the conference. Over 70 participants and observers from 15 countries from Europe, the USA, Australia, Asia and Mainland China attended the conference. «Finding Common Ground» is a Tibetan initiative to set in motion a process of exchange, interaction, cooperation and joint efforts between Tibetans and Chinese stakeholders in the pursuit of a peaceful and just resolution of the Tibet issue. His Holiness the Dalai Lama met the participants of the conference and made clear that he had always encouraged Tibetans to reach out to Chinese brothers and sisters. In his address at the meeting, he expressed his hope to serve Mainland Chinese Buddhists through Buddhist teachings and the promotion of secular ethics. He also reiterated his longstanding wish to go on a pilgrimage to Wu Tai Shan - a sacred mountain in China for Buddhists. Welcoming all participants, Kalon Dicki Chhoyang, Head of Department for Information and International Relations of the CTA, elaborated on the basic features of the Umaylam - the Middle Way Approach - adopted democratically by the Tibetan people as a policy in seeking a peaceful resolution of the issue of Tibet. In his keynote address, Sikyong Dr. Lobsang Sangay, the democratically-elected Tibetan political leader, stressed that "in the long history of peaceful and harmonious relations between Tibet and China, the present tragic state of affairs represents an aberration and exception. This aberration is the consequence of the military occupation of Tibet. The Middle Way Approach represents a realistic and pragmatic way to re-establish genuine friendship and peaceful coexistence between Tibet and China." Chinese participants expressed their respect and deep appreciation for Tibetan culture, Buddhism as well as for His Holiness the Dalai Lama. According to them "a peaceful resolution of the Tibet issue is not only the concern of the Tibetans but that it has great relevance in which direction China as a whole moves forward." Consequently, unanimous support for the Middle Way Approach was expressed in a separate statement issued by the Chinese participants. Moreover, Chinese participants stressed the importance of making more information on Tibet in Chinese language available and using modern communication more effectively in reaching out to a wider Chinese audience. The statement of consensus of the conference listed several points including the need to hold the conference «Finding Common Ground» annually. 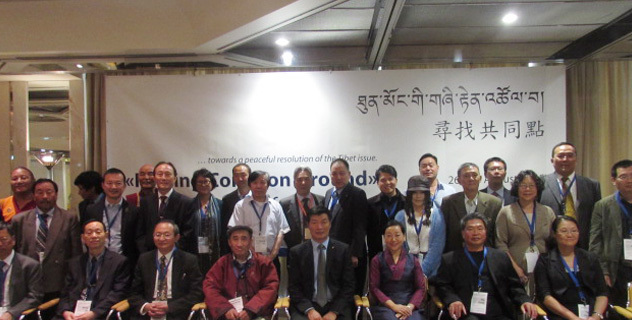 More than 70 participants from 15 countries and regions including among others from Europe, the Americas, Australia and China took part at the Sino-Tibetan Conference "Finding Common Ground" from 26 - 28 August 2014 in Hamburg, Germany. In conjunction with His visit to Hamburg, His Holiness the Dalai Lama graced the participants with an audience and said, "I give special attention to contacts between the Chinese and Tibetan people and strongly support it. In the 1950s, I had expressed my wish to go to Mount Wutai Shan for a pilgrimage which has not yet materialized, but I still have the desire to go there for a pilgrimage". His Holiness the Dalai Lama further said, "President Xi Jinping said that Buddhism has an important role to play in reviving Chinese culture. Being a Buddhist I can definitely make my contribution to this." Sikyong Dr. Lobsang Sangay, elected political leader of the Central Tibetan Administration, in his keynote address, said that historically Tibetan and Chinese people have existed peacefully with each other but today's grave situation is an unprecedented one. He recognized that Middle Way Approach and mutual understanding would help dispel the misunderstandings, mistrust and misleading things between the two sides. Ms Dicki Chhoyang, Kalon for Information and International Relations, in her welcome address, said the Tibet issue is related with the survival of a nationality and the preservation and promotion of its unique identities. The resolution of the Tibet issue is directly related to the interest of China. Ms Li Jianglin, scholar on history, in her presentation, delineated the evolution of the nationality policy of the Chinese Communist Government. In the beginning the Chinese Communist accepted and supported the right of people to self-determination. They had the right to choose to join the Federation of China. But gradually they have changed this policy, disregarded the right to self-determination and deleted these from official documents. - to acknowledge the conference "Finding Common Ground" very meaningful and express that such meetings should be convened annually. It was agreed to form a working group of Tibetans and Chinese for that. This document has been translated into English from the Chinese original. In case of any discrepancies, the Chinese original is the final and authoritative document.